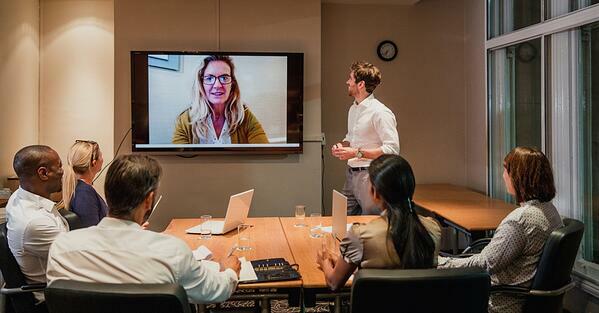 Videoconferencing systems have traditionally been expensive to procure and difficult to operate. In the past, whenever videoconferencing meetings took place, a specialized technician was almost always needed to be on call to take care of any technical issues that might arise during the meeting. This often made videoconferences cumbersome and expensive to run, which made a lot of executives abandon videoconferencing in favor of an audio-only telephone call and a speakerphone. Such phenomena are a thing of the past with Yealink’s Next-Gen videoconferencing solutions. Yealink has developed a framework that allows associates to interact easily and efficiently using the most sophisticated and up-to-date hardware and software. With simple and intuitive controls, almost all videoconferences can occur without the need for a videoconferencing guru on hand. Yealink’s endpoints fall into four categories: conference room systems, video phones, software-based systems and SIP-based video telephony. Conference room systems – This category is comprised of the VC series devices, which includes the VC500 and the VC200, among others. These are systems for conference rooms where multiple participants would typically be sitting around a table. With a camera and microphones, this system sends both video and audio, and after it is connected to a TV monitor or data projector, can also display video from the other end of the call. Video phones – These are SIP-based IP telephones that have a screen and camera and provide simple video telephony to its users. 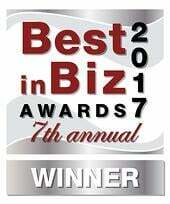 The T49G and the T58V fall into this category. Software based systems – VC Desktop and VC Mobile are videoconferencing apps that can be installed on a desktop or laptop computer, or on a mobile phone, and can be used on the go. The WebRTC option, which implements videoconferencing over a web interface, also falls into this category. SIP-based video telephony – This involves the use of a SIP client on any mobile or desktop phone that is compatible with video telephony. All of the above endpoints are compatible with the videoconferencing solutions from Yealink described below. 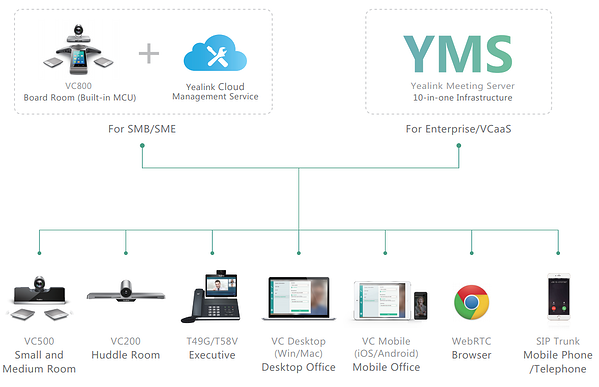 To incorporate larger numbers of participants in videoconferences and to safely and securely include remote endpoints that are not within the confines of the enterprise network, Yealink offers the following solutions. Board room conference device with built-in MCU – The VC800 is a videoconference device with a built-in MCU (multi-point control unit) that allows up to 24 videoconferencing participants to join in a single meeting. The device has a state-of-the-art camera and microphones, as well as a touchscreen interface, which, when connected to a projector or compatible TV, will provide an excellent videoconferencing experience. Videoconferencing Management Service – Possibly the most innovative of the Yealink videoconferencing infrastructure, Yealink's VC Cloud Management Service (VCMS) has an easy-to-use, cloud-based videoconferencing infrastructure that is compatible with Yealink’s videoconferencing endpoints and apps. The VCMS offers significant convenience and cost savings to integrators and business customers in terms of deployment, configuration and usage. The VCMS includes a built-in directory server, a SIP registration proxy server and a traversal server. 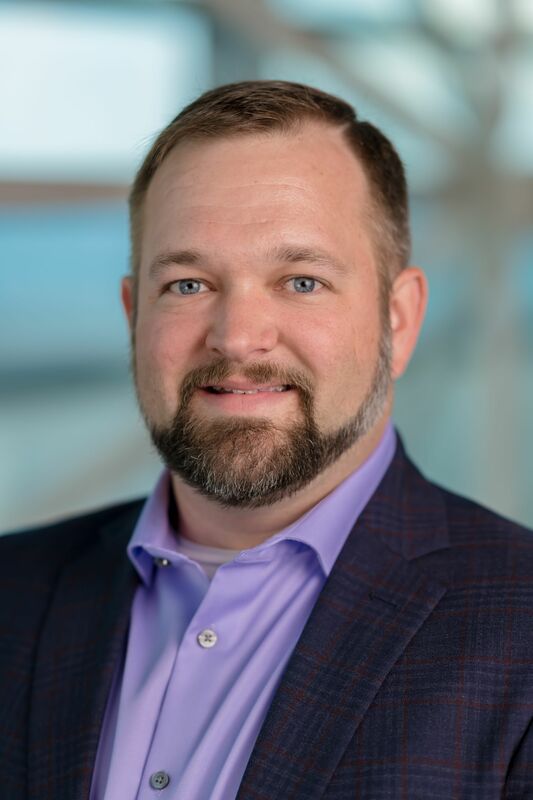 This is especially convenient for remote employees, as it streamlines much of the task of getting remote users to connect easily, quickly and with little hassle. If your business is growing, you’ll quickly see the benefits of a distributed workforce, including increased productivity, decreased costs, and reduced employee turnover. However, there are drawbacks that come with having personnel that rarely, if ever, meet face to face. Yealink comes to the rescue for companies of all sizes with a suite of easy-to-use, state-of-the-art videoconferencing solutions.